Take a look around Tower Festival Headland. 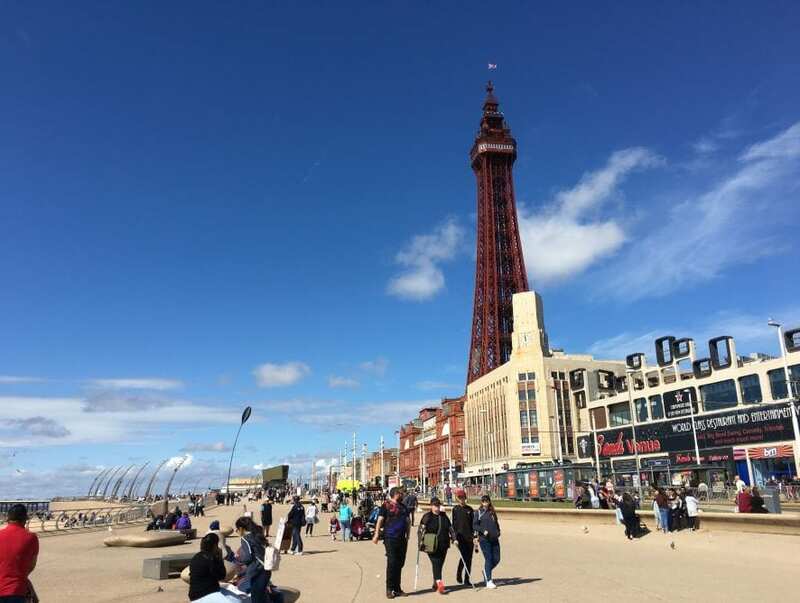 It’s the seafront between Blackpool North and Central Pier – watched over by the famous landmark that is Blackpool Tower! Tower Festival Headland is the area of public realm for your fun, leisure and entertainment – it’s in front of Blackpool’s famous Tower. The sea defences, completed in the late 2000’s, sweep outwards to extended the space considerably. They go an extra 60m seawards to create a major entertainment space with a capacity for 20,000 people. Have a look at this video clip taken in late July when the temperatures were at record highs! Come on in the water’s lovely! The Blackpool Illuminations Switch On Event is held here on Tower Festival Headland. 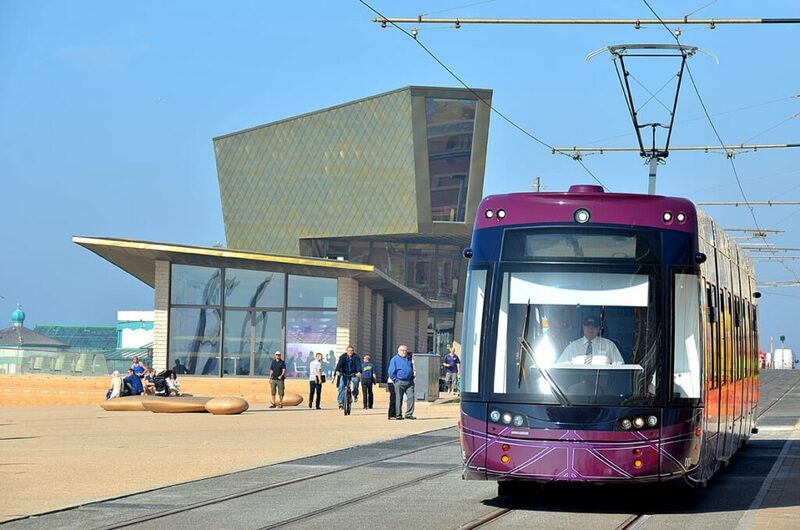 When major events like this are held, the promenade road and tram tracks can be closed and their shared space incorporated into one huge and safe area for performance. The first official opening concert by Sir Elton John was held on Saturday 16 June 2012. The Headland is where you will find the well known and hugely popular Comedy Carpet which opened in early 2012. 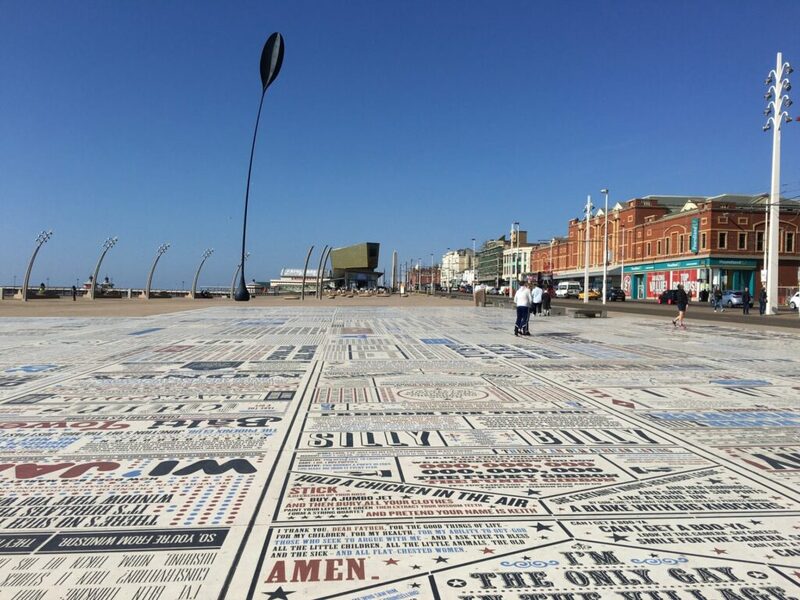 A new icon for Blackpool, it features jokes, songs and comedy catchphrases from Britain’s best loved comedians. Around the edge are seats, huge pebbles to sit on and lighting columns (on the left of the above photo and right, below). These are the frames for the windbreaks which are used at big events, making a versatile space that’s popular with everyone and enjoyed all year round. Don’t forget the kinetic sculptures – the 35m high Dune Grass blades which bend and sway in the wind. You can see them in the photo above. Tower Festival Headland is also where you’ll find Festival House. This new modern building is clad in twinkling gold tiles. 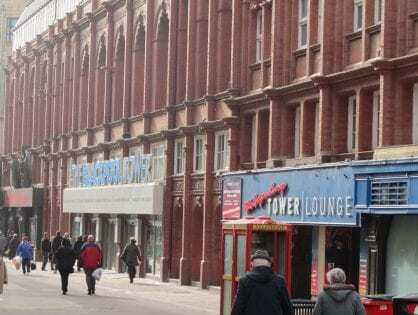 It stands against the sea and is the home to the Visit Blackpool Tourist Information Centre. Upstairs is the Wedding Chapel where you can get married looking at the Tower through the window at the top left of the tram. There are breathtaking views of the beach through the front windows. The rest of the building is The Beach House, a seafront cafe restaurant. In July 2012, Festival House was named as one of Britain’s 50 best new buildings by RIBA (the Royal Institute of British Architects). Just three buildings were chosen from the north west region to be named amongst the best in Britain for architectural excellence and Festival House was one of two in Lancashire. The architects for Festival House were dRMM, the building contractors were Parkinson Building Contractors of Blackpool and the project was managed by Blackpool Council’s Capital Projects Team. In November 2012, Blackpool Tower Festival Headland won the Design Excellence award in a national design competition. The award at the Regeneration and Renewal Awards held in London was made to independent design consultancy LDA Design. LDA Design began working on the project in 2007 after winning an international design competition. 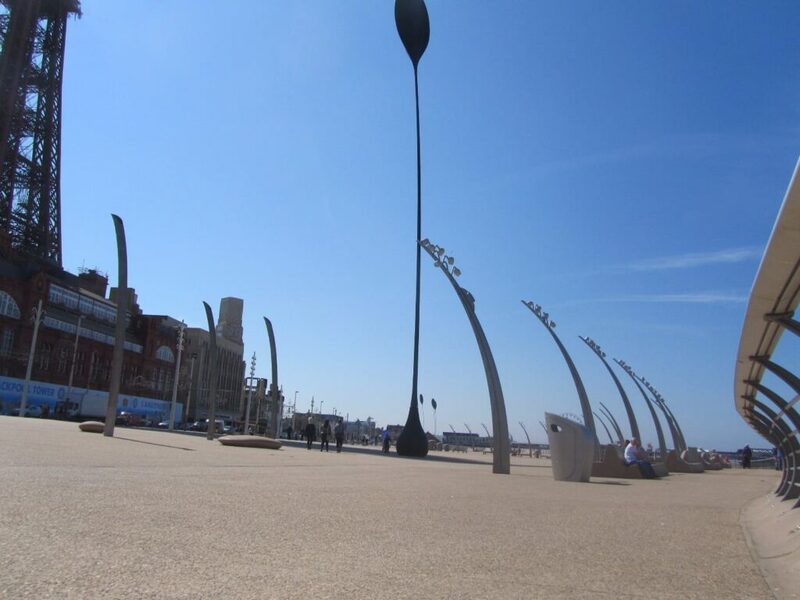 The design was for a playful and surreal landscape along Blackpool’s seafront. It was inspired by Blackpool’s tradition of fantasy and escape and recalled the natural dunes that once formed the coastline. The whole of Blackpool’s seafront between north and south piers has been completely rebuilt, with a modern design including Spanish Steps that link the beach to the promenade. It’s a curvaceous piece of engineering from end to end. It lends a really attractive look to a huge, practical area of concrete which also incorporates traditional vertical areas of sea wall into the design. Stand against the steps at high tide and you can see why they work. The energy of the tide is instantly dissipated as the water crashes against them – simple but very effective. 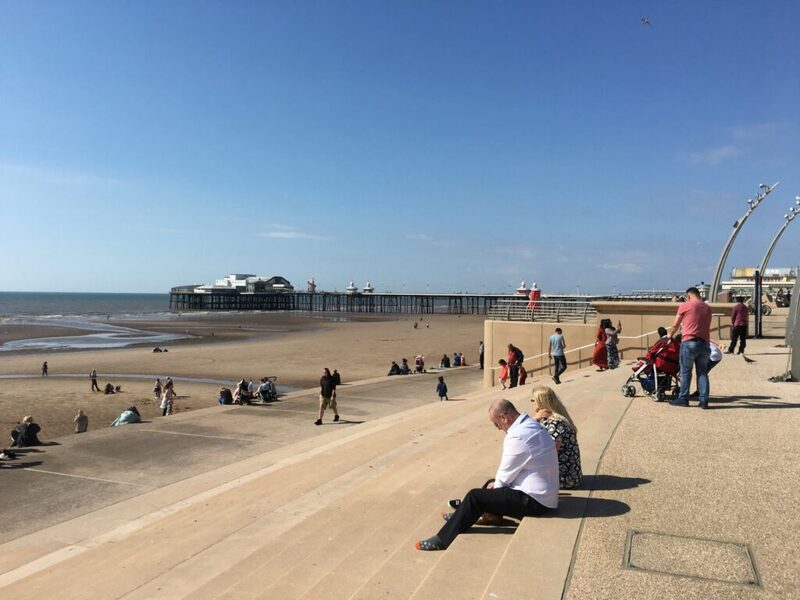 The Spanish Steps make for fabulous access to the sands and provide great seating for free events like Blackpool Airshow, where literally thousands of people can sit for a perfect view. They’re also a great place to sit and enjoy the seaside view of miles of unspoilt golden beaches. It was the rebuilding of the seafront and it’s extension seaward which enabled the Tower Festival Headland to be built. Would you like to own Blackpool Seafront? 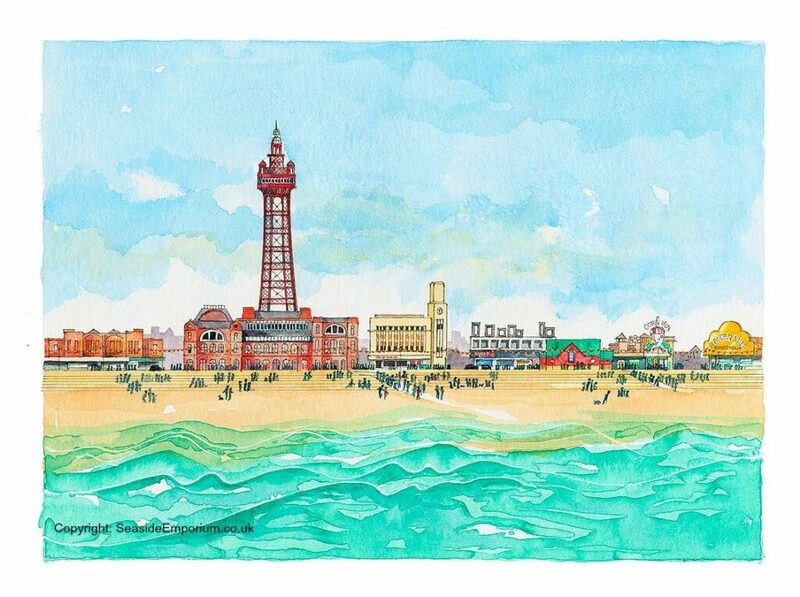 Live Blackpool is part of Visit Fylde Coast, a digital media product which is independently published by The Rabbit Patch Ltd. We’re a design and creatives company right here on the Fylde Coast and we have an online shop called Seaside Emporium where we sell our own original art. This is our original watercolour painting of Blackpool Seafront – it’s available in various sizes as a framed, mounted or plain print.